Continuing the theme of making the backyard better by saving it from the ravaging effects of gravity and time, we visit the lower deck in the backyard. The Jack-All (pictured) and my dad's wisdom saved the day once again. 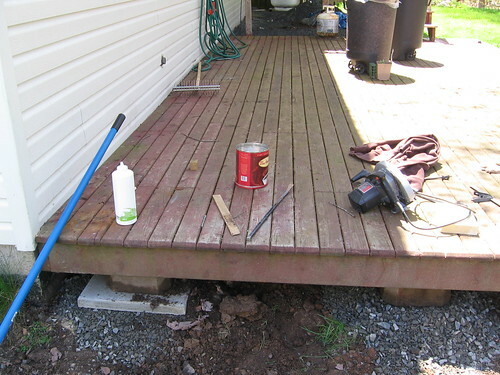 Project: Jacking up the deck, originally uploaded by BigAssSuperBlog. Continuing the theme of making the backyard better by saving it from the ravaging effects of gravity and time, we visit the lower deck in the backyard. The Jack-All (pictured) and my dad's wisdom saved the day once again. It was easy to see that the deck had sunk: the dimtwits who owned the home before us stained it in a hurry and left some smears of stain on the vinyl siding. The deck had an obvious dip as it came toward the edge of the house. At its furthest edge, it was several inches below where it should've been. The problem was not entirely obvious -- the deck was so low to the ground that we could not even see what it was supposed to be sitting on. A trip to Rona brought home some concrete pavers. 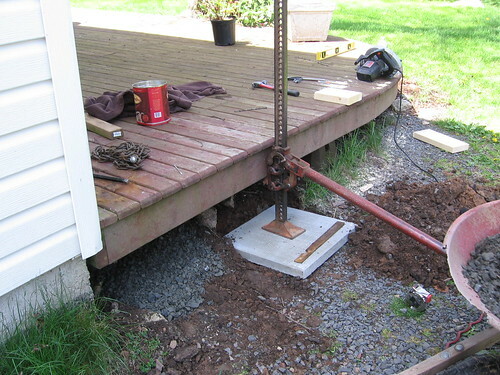 The Jack-All was placed on one of the pavers and we slowly lifted the entire end of the deck. Some prybars, screwdrivers and wedgy things stopped the rising edge of the deck from catching on the vinyl siding it and crushing it as the deck went up. Once the deck was level, the sunken deck block was revealed. 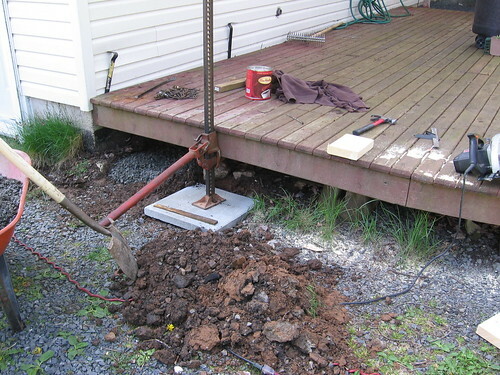 Through time and soft earth, the deck block had buried itself a few inches into the muck. We dug that out and laid in some gravel. It took a combination of trial and error and a bit of math to find the right level at which to declare the gravel enough. A concrete paver went on top of the gravel, and the deck block on top of the paver. The gravel would stabilize the ground, the paver would spread the load over a wider area so it would sink more slowly, and the deck block would be the saddle for the deck joist to sit in. If you look at the picture above, that corner on the left was sitting around the black foundation spray. Now it's up high. The tricky part here was getting the deck block in the right spot to lower the boards back onto. We left it a tiny bit high to allow for the gravel to settle, since we didn't have the means to compact it properly. The project moved along the outer periphery of the deck, adding gravel and adjusting the deck blocks as we went along. In all, I think we adjusted four of the five outer deck blocks. All it took was a little shimming on one of them to make the whole outer rim stable and solid. Now, all this outer lifting did leave a presumed sunken block at the center of the deck still sunken. There was no practical way to address this other than to find a dwarf handyman to crawl underneath, or pull off deck boards and work from below. This left the middle of the deck with a bit of bounce, but the overall structure is now supported better than ever, and best of all, it's just as level as we want.... accounting for a bit of slope away from the house for the sake of runoff. All in all, a tremendously successful project. Big thanks to my father for his wisdom and strength. All it took was about two hours. Not much time at all, considering how much time we'd been worrying about it!